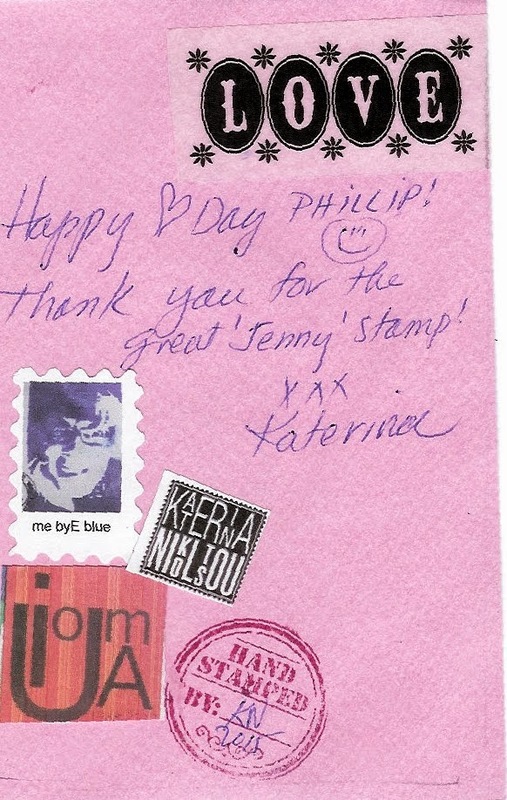 Remember last year's world day of faux stamp artists organized by Tony M? 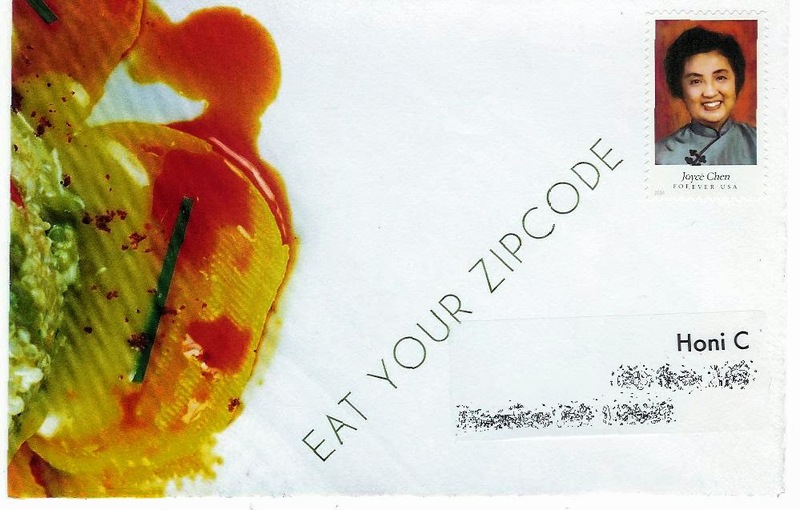 For 2014 all the faux stamped mail was sent to Eni Looka. 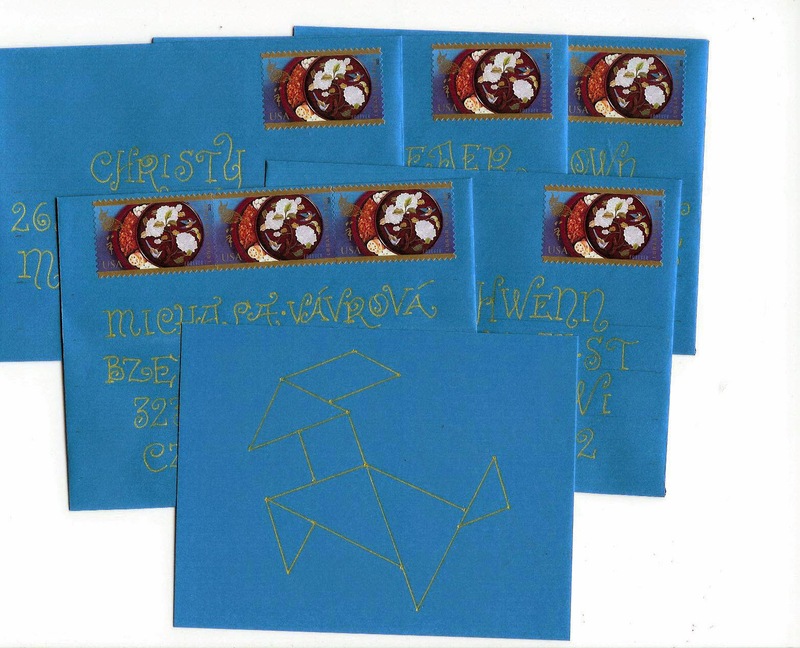 I created 5 pentagonal stamps celebrating the 5th year of this festive occasion, and sent 5 pieces of mail to Tony so that he could mail them in France, where La Poste agreed to allow faux postage on mail to Eni to be accepted and delivered. 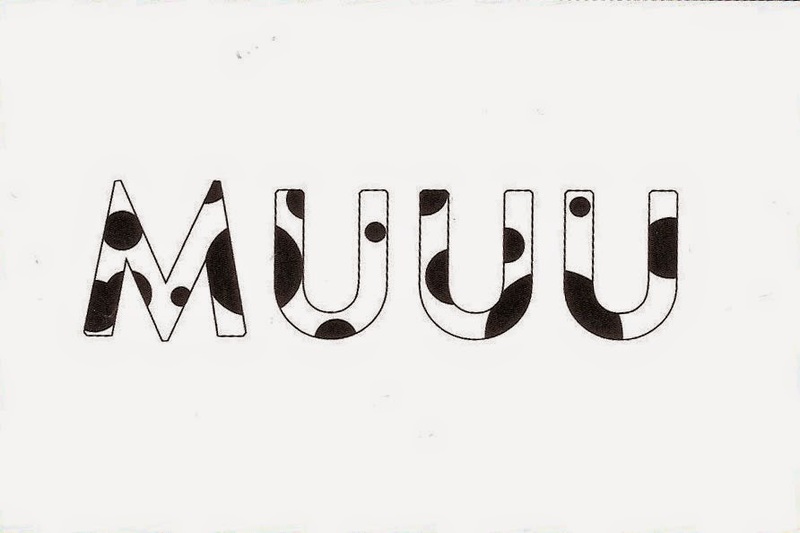 Eni sent this amazing and huge (9x9 inches) envelope in thanks. 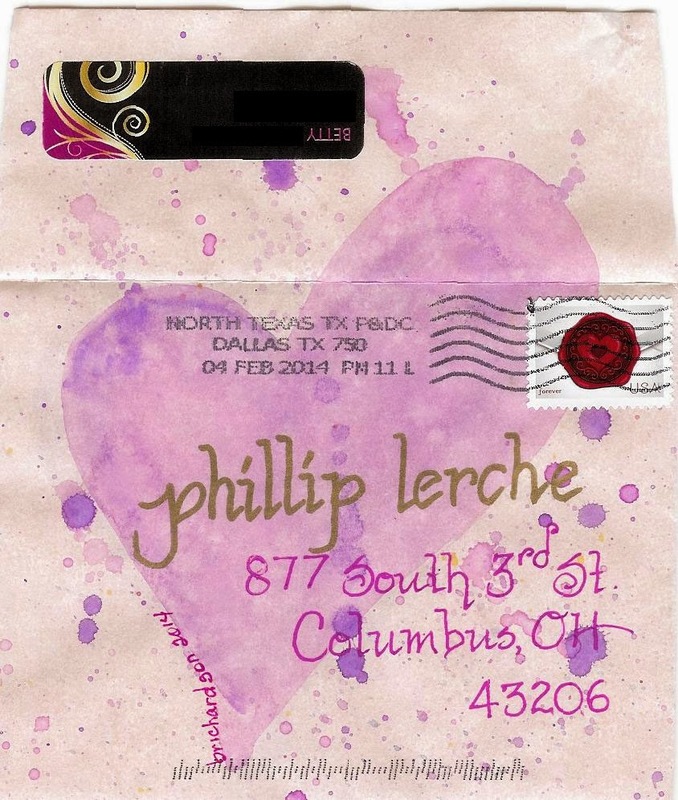 Note the beautiful circular faux stamp he used. not sure what the big blue T is about (presumably a postal mark), but no actual stamps anywhere to be seen. 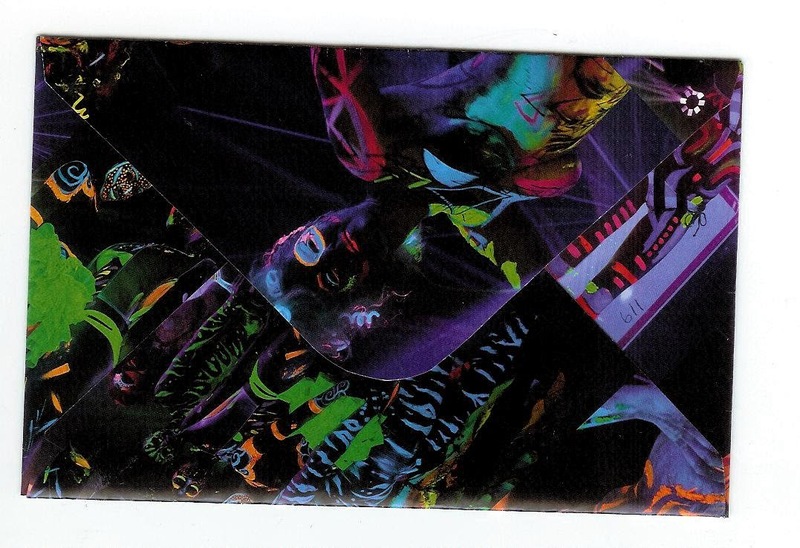 The underlying colors behind the cut design came from this. 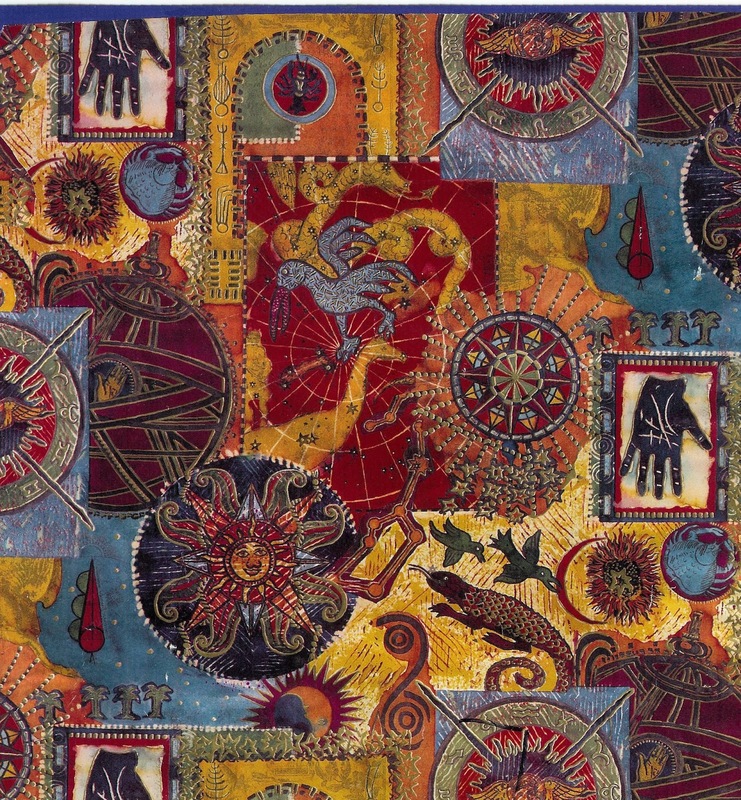 I think this is pretty fancy wrapping paper - sumptuous colors. Amazing how something can be covered up a little and change its appearance completely. He is clearly a master of cut paper. Inside were these well wishes for 2015. So clever that the letters e and a, and the numbers 2 and 5 all have the same shape. 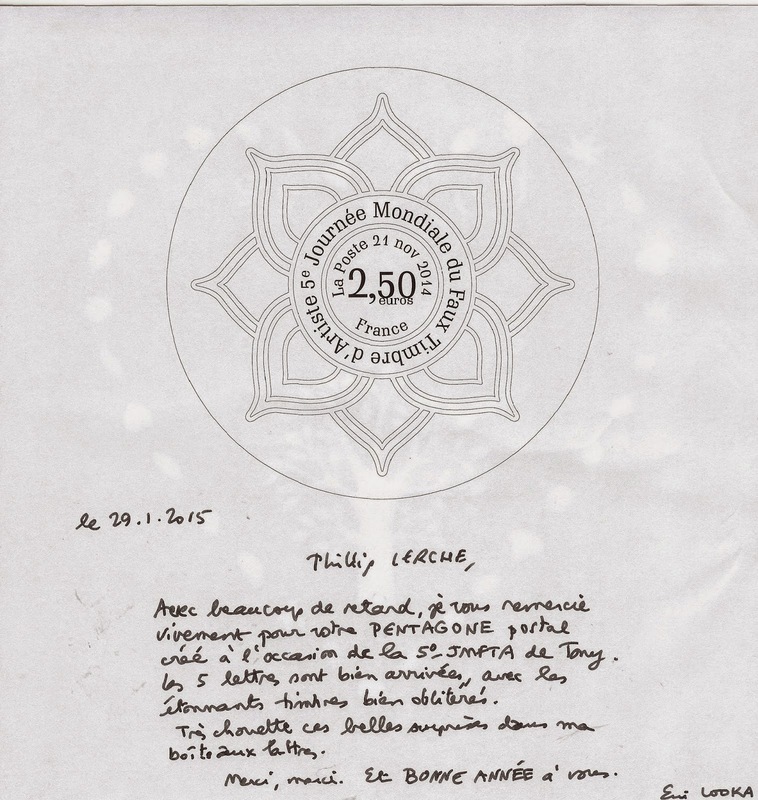 And a large, uncolored design of the stamp with Eni's note. Thank you very much, Eni, this is amazing. 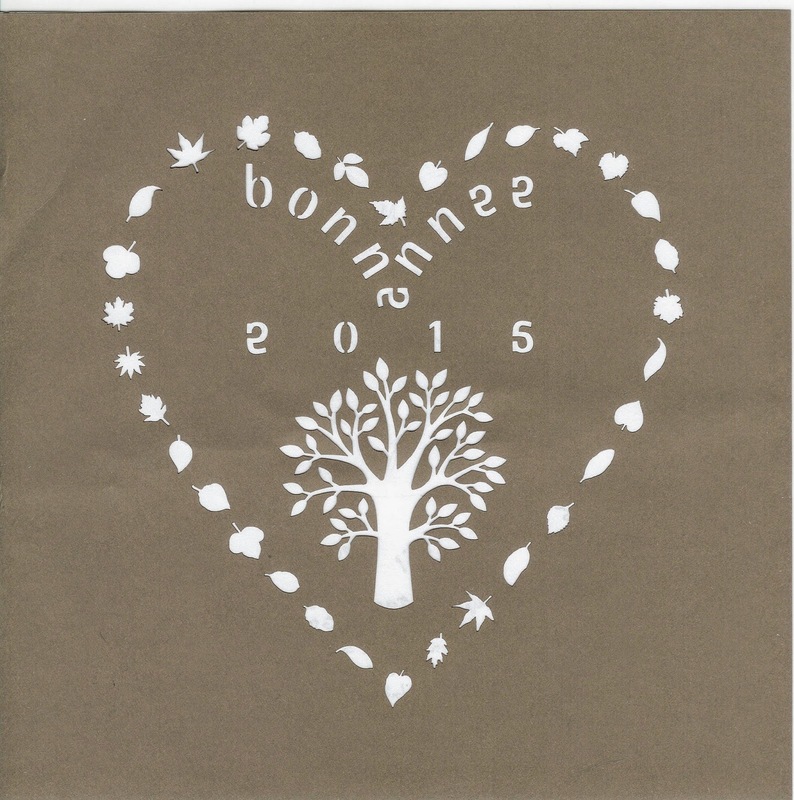 I received this great homemade hotel-made envelope and perfect matching stamp from Australia. To my surprise it was from Eric, who was on vacation there. 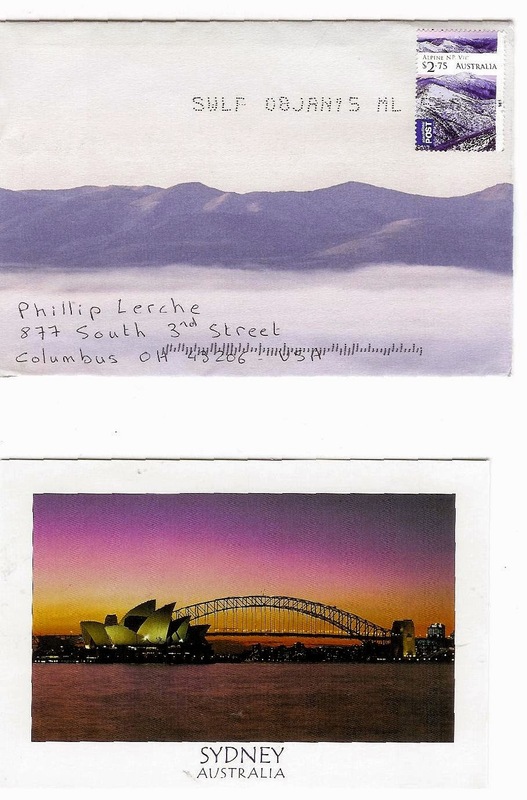 So my first Australian mail is from a Frenchman. Enveope 291 to Liberty. Bon voyage. 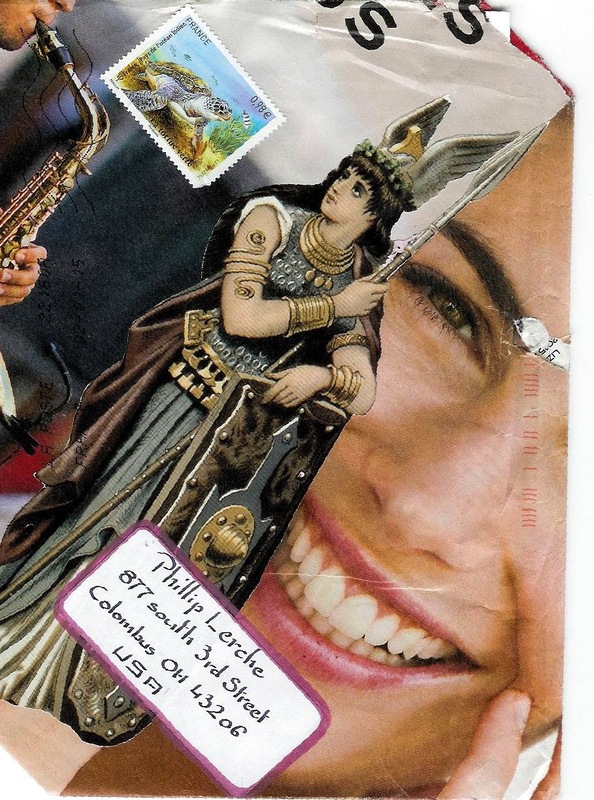 A surprise smiling envelope from the mailarteeth instigator. 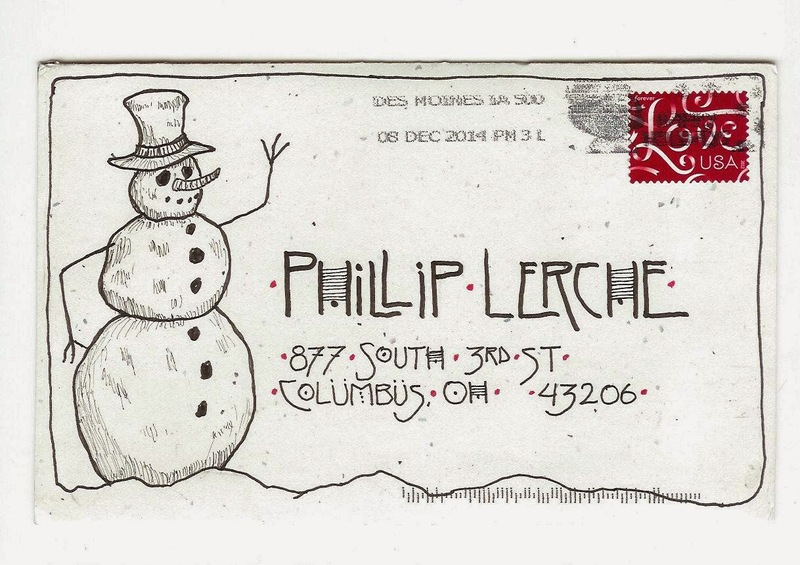 With a wish for a happy 2015, and a note that the mailarteeth will be on exhibition in March. 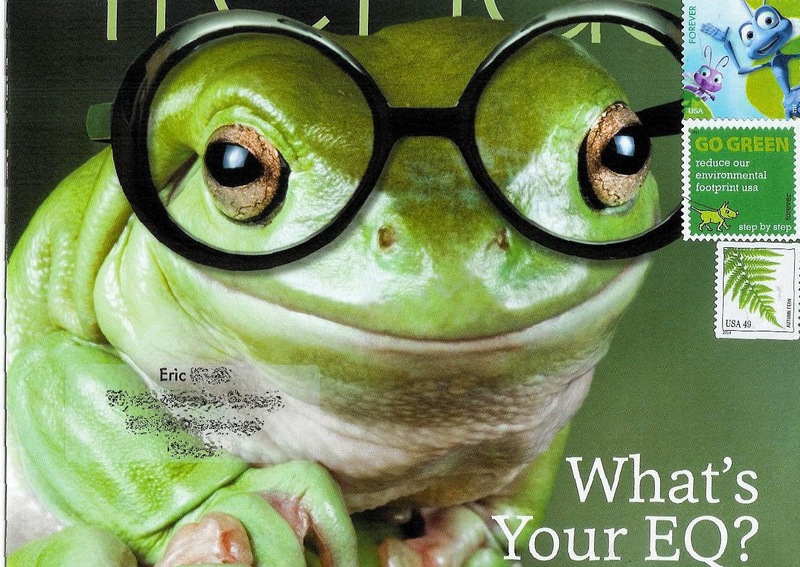 A frog for Eric's collection. 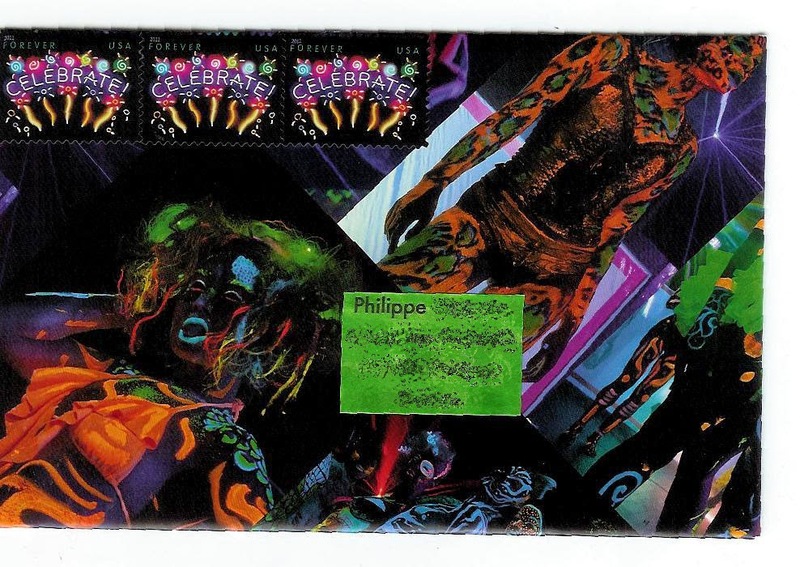 A neon happy new year to Philippe - the perfect envelope for the celebrate stamps. Yesterday's update can count as part 1. More Mailarteeth... this time, canine dentition. Bonus link, appropriate for the snowy scene outside. Are you available to run a Post office, Shop and museum in Antarctica? (Among other things). If you do take this job and read the blog, please send me mail! British Antarctic Stamps are stunning. 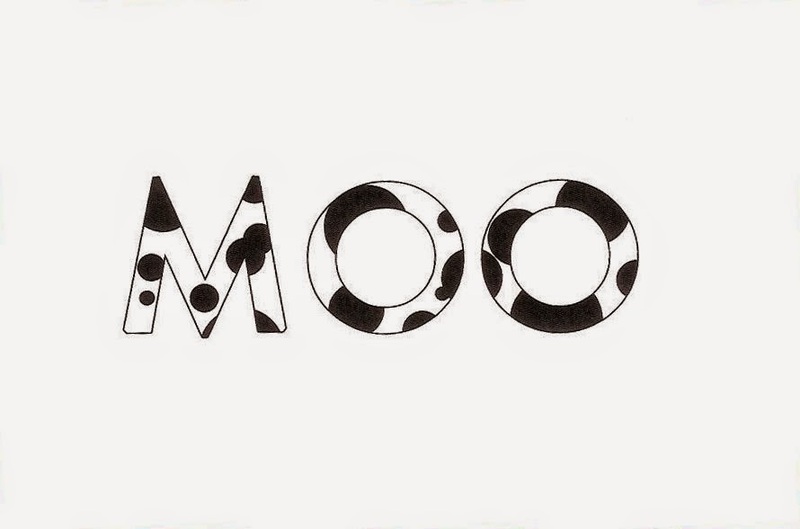 Eric and Eva have a thing for cows. I sent each of them a set of nested envelopes. 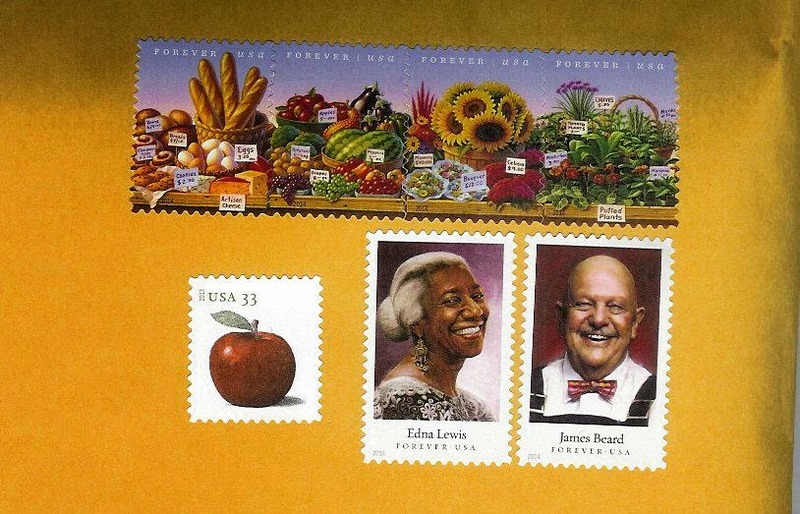 I am usually drawn to the Julie Chen stamp when I look at the celebrity chef sheet - must be the brighter colors. I'll have to start finding some envelopes fro the other chefs - I've only got 1 Julie left. It's the Year of the Ram! or Sheep! or Goat! I hope it isn't cheating to have my Sunday Stamps entry a few days early, on the first day of the year of the ram (or sheep, or goat). 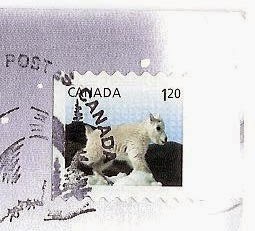 Baby mountain goat stamp from Canada, from a series of baby animals. $1.20 is the rate to send mail from Canada to the US. 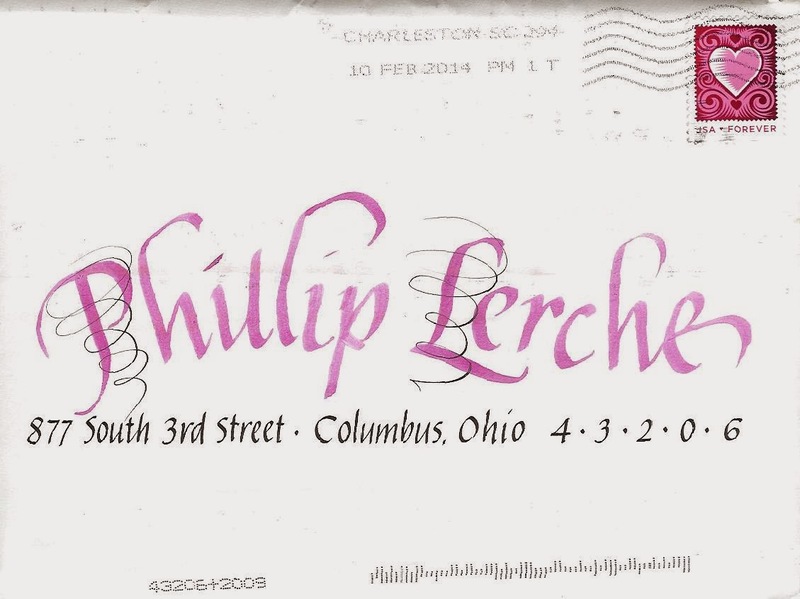 The envelope is the real story - this is the most amazing mail I have received in 2015, and one of the all time best. 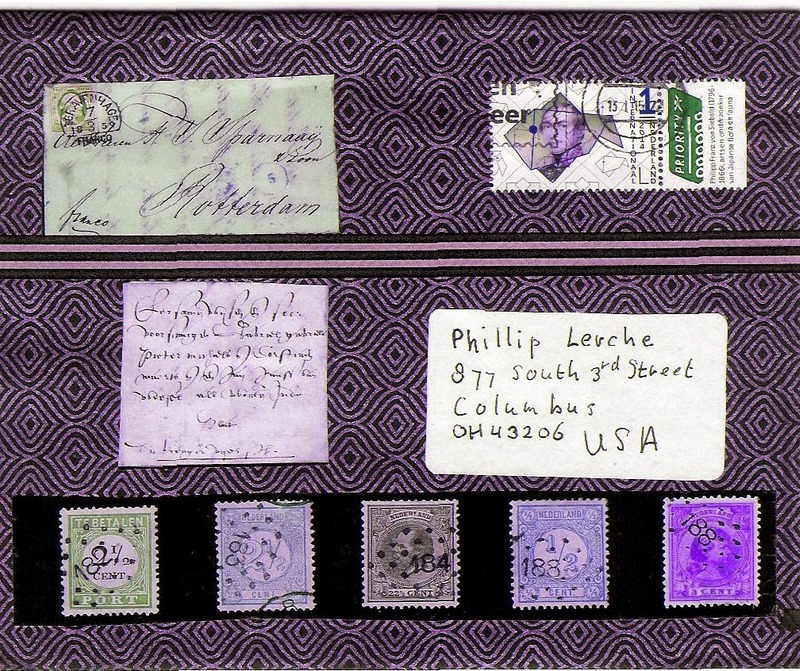 The envelope has travelled on part of its journey by dog sled - through three towns, each with a postmark on the front. 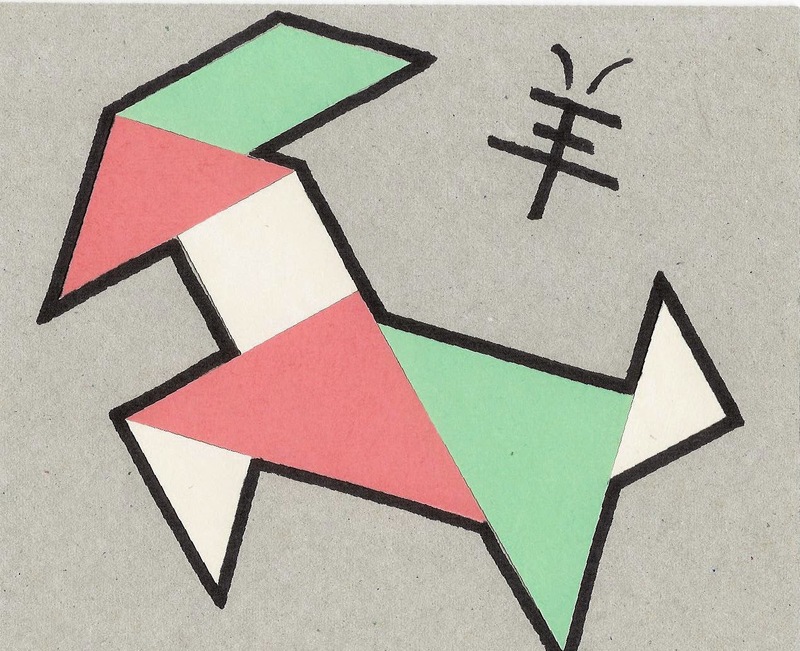 I sent this tangram goat to Karen I, host of MMSA, for the first challenge of 2015. 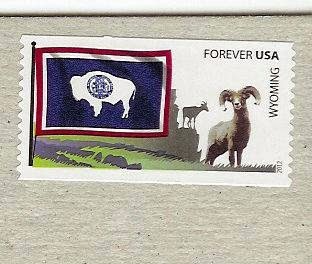 Karen's was stamped with the Wyoming 'Flags of our Nation' stamp, featuring bighorn sheep (and a bison on the flag). 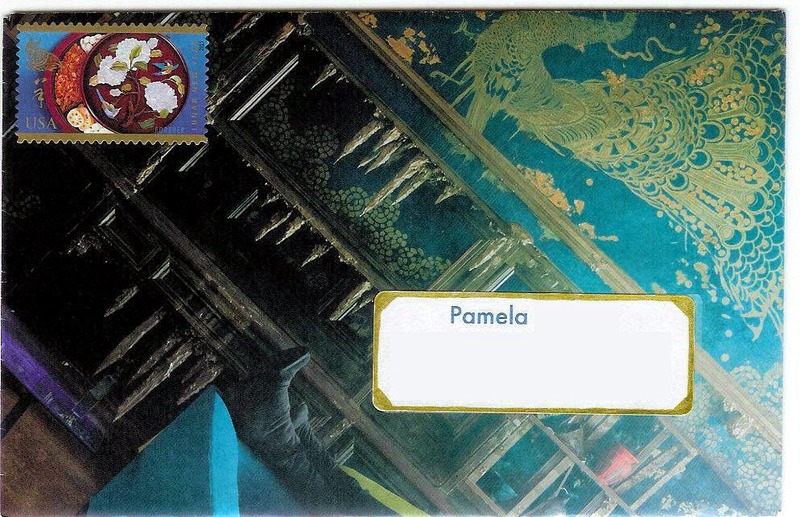 The ones for the swap were additionally stamped with the brand new Year of the Ram stamp, as after I mailed Karen's I realized the 'postcards' exceed the letter size, and thus need large envelope postage (98c, or two Forever stamps). I think the Year of the Ram stamps look fantastic in person, however they never scan quite right. 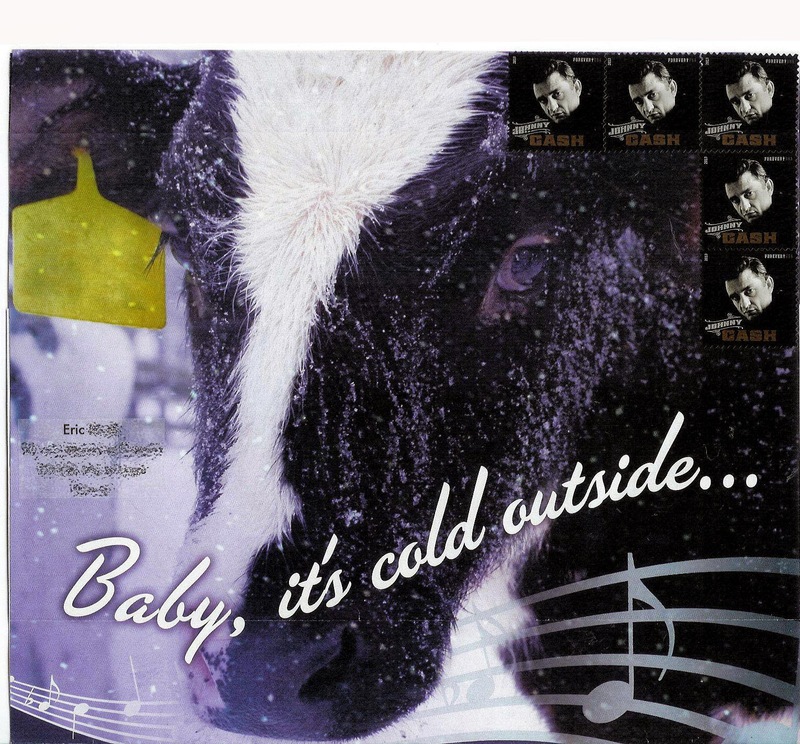 Even the USPS image isn't quite the same - the gold parts never look as good as the real thing. ...and I used them on my envelopes for Jean & Jan's February envelope exchange. 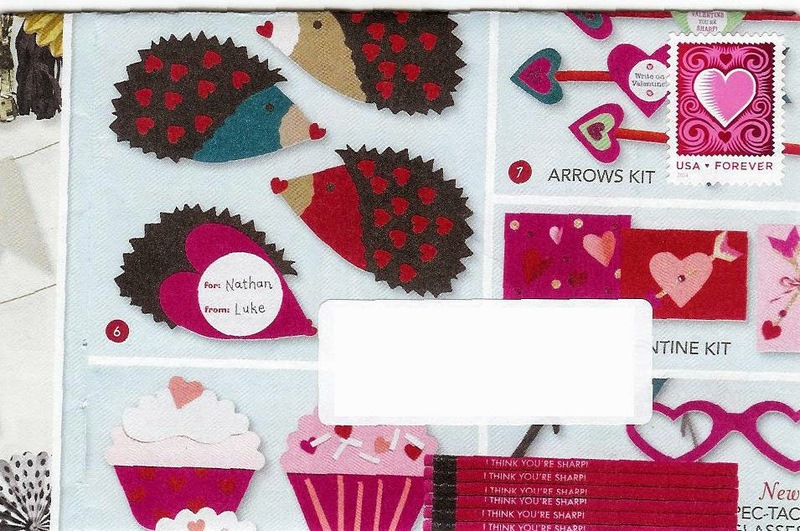 The suggested theme was hearts, red, and St Valentine's Day, or personal choice. 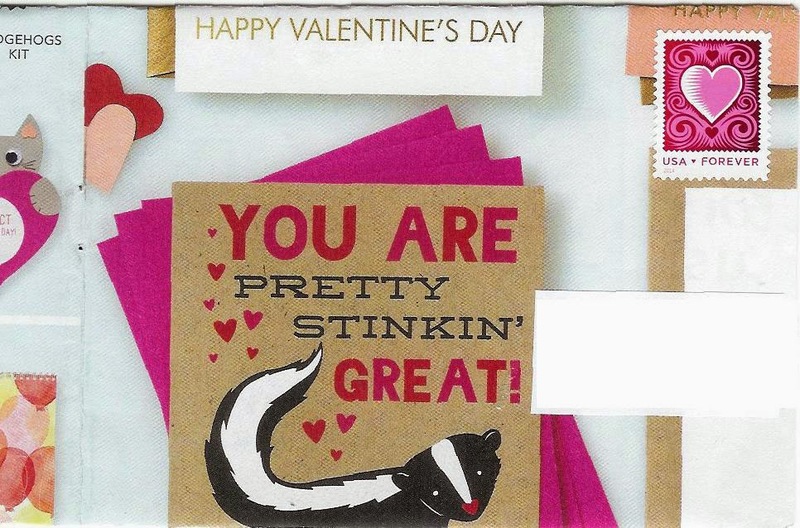 I am not really one for St Valentine's day, so I sent out Year of the Ram greetings, accompanied with the new stamp. Don't be shocked, regular readers, but for a change I used commercial stationery and Jean's wrought iron lettering. I think they make a nice set. 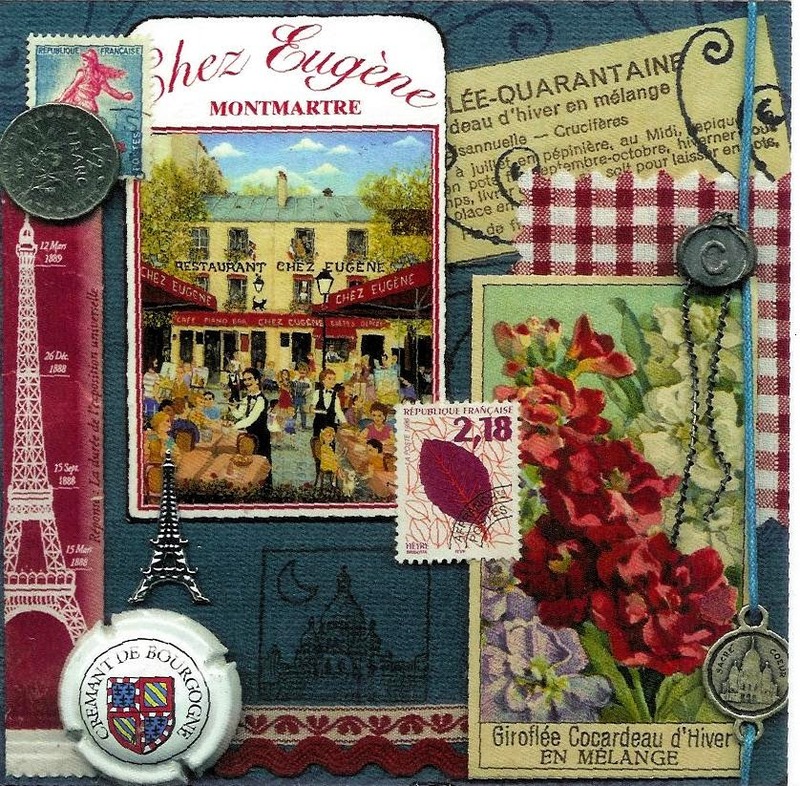 The one with 3 stamps is heading to the Czech Republic - hope it makes it! 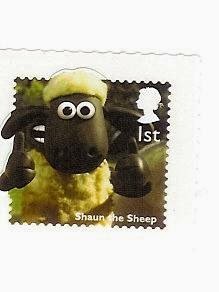 I also have this mint Shaun the Sheep stamp from the UK. He'd be perfect for mail sent in the Year of the Ram. And on the topic of British stamps... Royal Mail released this fantastic set of eight stamps today, celebrating Inventive Britain. 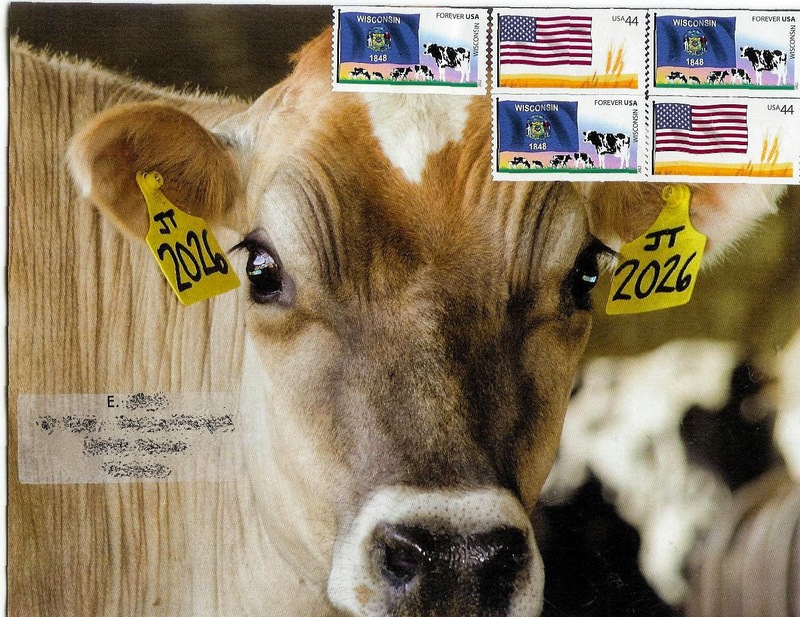 A pity you can't use another country's stamps on US mail, as they would work with many of my envelopes. A last-minute entry for Spirit of the Forest, title "Leftovers II". The Spirit of the Forest blog shows all the art received, as well as photos from the exhibit. 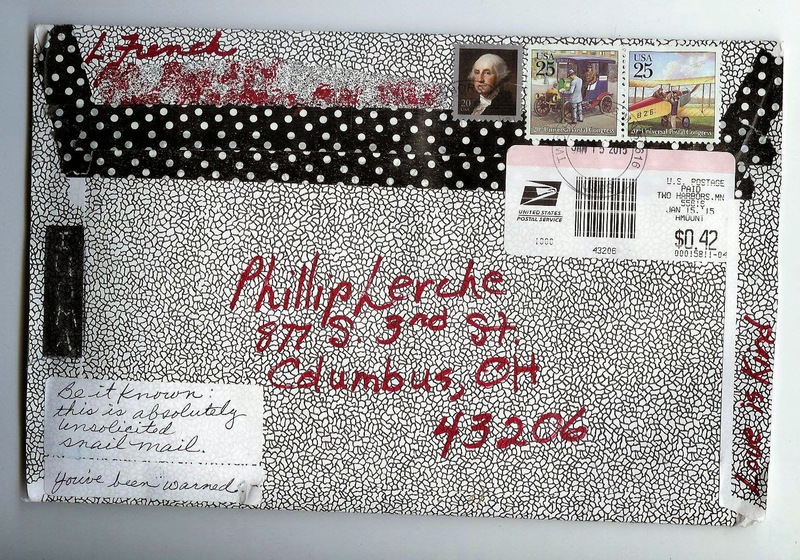 I think it is a great subject for mail art, and there are some amazing pieces in the collection. 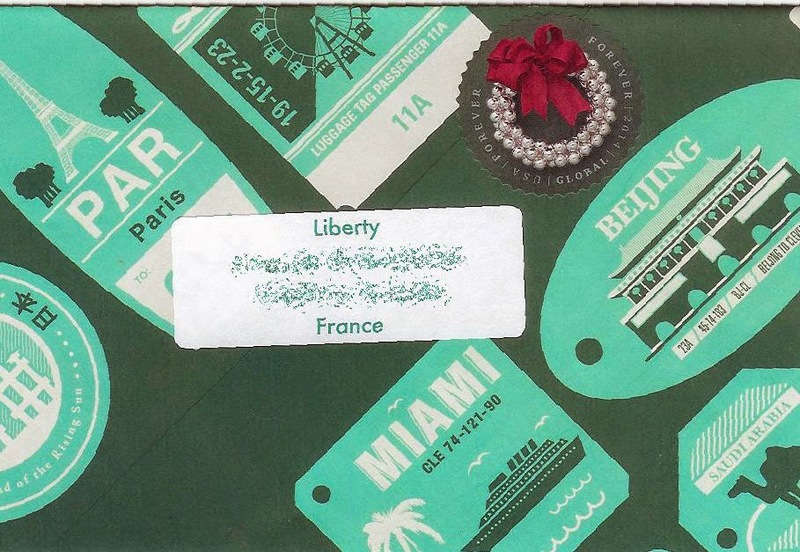 A vintage-looking hand made and decorated envelope from Nina in the Netherlands. 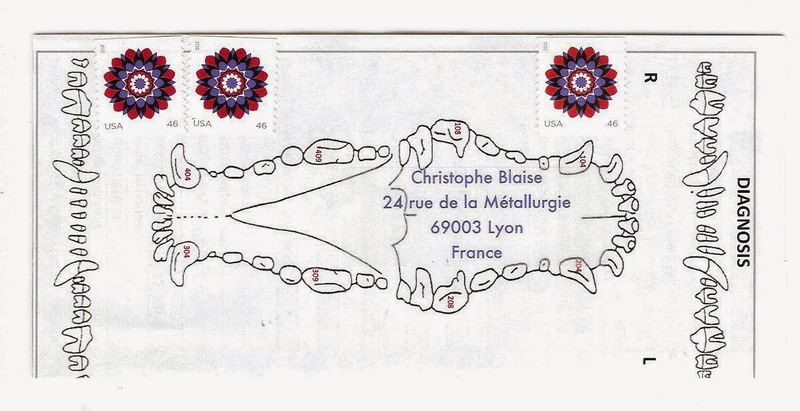 Interesting stamp, with its origami outlines. It is one of a set of 6 issued in 2014 that celebrates Dutch-Japanese relations, and is part of an ongoing series 'The Netherlands and beyond'. Nice article about this set here. Philipp was a physician and botanist, famous for cataloguing Japanese flora and fauna. He also had a third first name, Balthasar, maybe that was too long to fit on the stamp. Philipp was father to the first Japanese woman to receive western medical training, well-regarded doctor Kusumoto Ine (also known as O-ine). He was exiled for being in possession of forbidden (at the time) maps of northern Japan, and did not see his daughter until she was in her 30s. 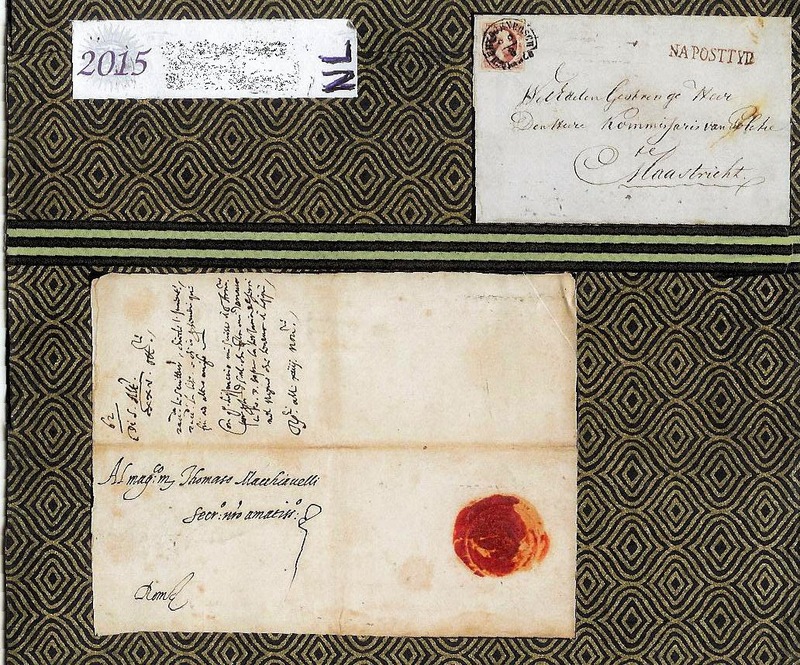 And interesting to see that the Dutch stamp has the equivalent of an airmail label attached as the selvage. Nina also included ephemera like that she attached to the envelope for me to use - I am not much of a collager, but I'll have to become one to clear my desk of all this stuff. 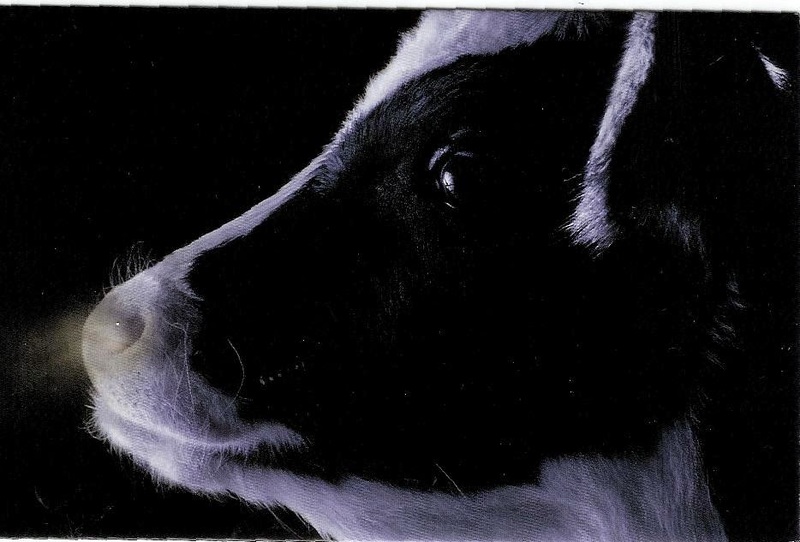 The scanner really didn't like this one at first, which surprised me. I'm beginning to think it doesn't care for orange too much, but who knows. Maybe it wants to make its own art? Linda decided to off load some of her ephemera for me to use - aarrgghh, just what I need, more stuff! 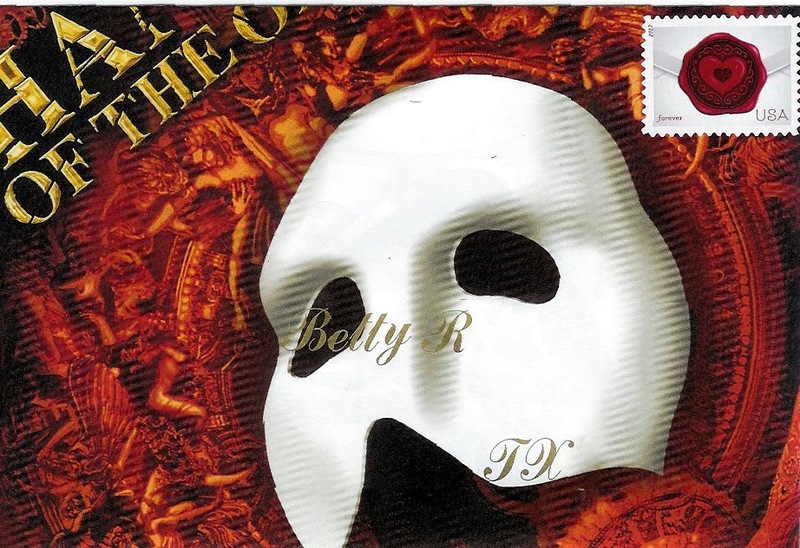 The packet came in this reversed security envelope. 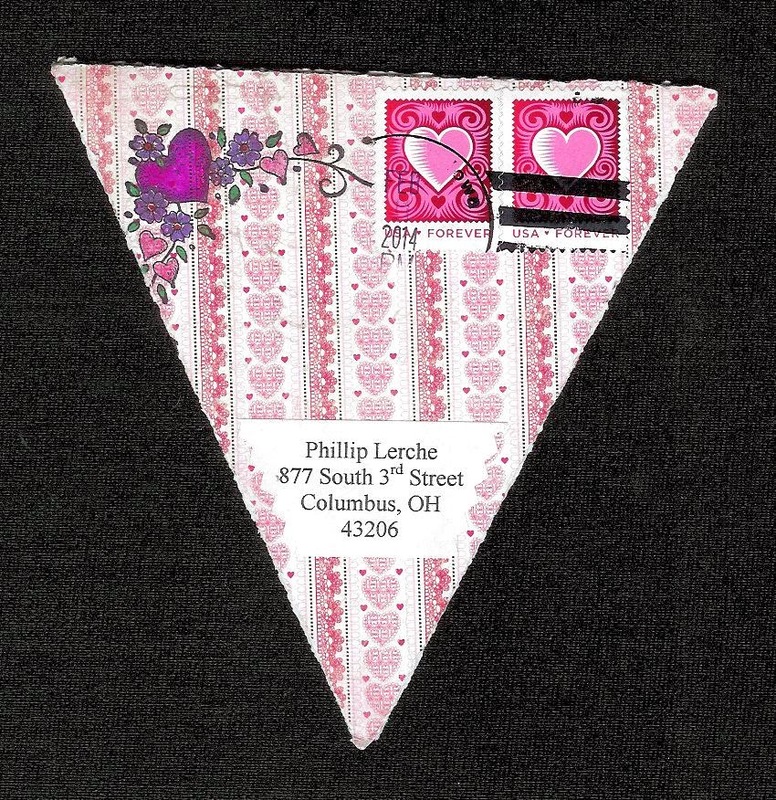 Linda used some great vintage stamps I haven't seen before, and had to bump up the postage to cover the 3 to 3.5 oz weight. 49+21+21+21=122 Or maybe it's 2-3 oz (91) with +21 for uneven thickness. And the back with some junk poking through the window mini-aquarium. 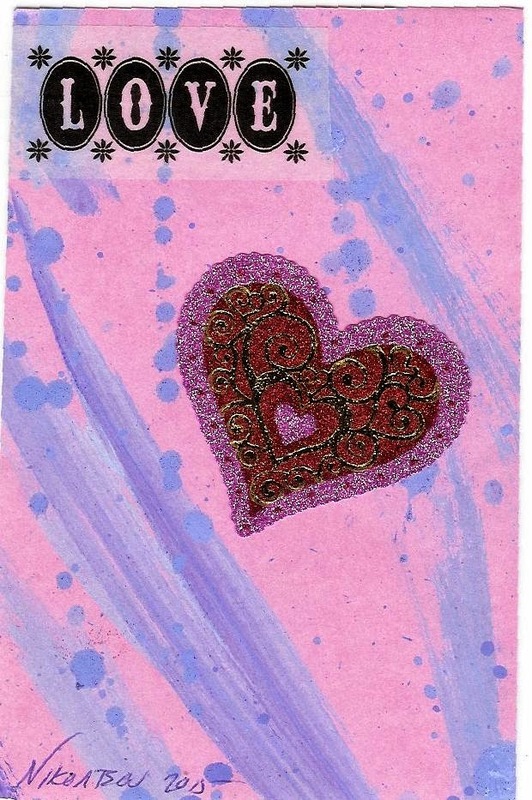 St Valentine's day is the Sunday Stamps theme (I'm about 6 hours early, although blogger seems to use pacific time, so make that 9 hours early on the timestamp). 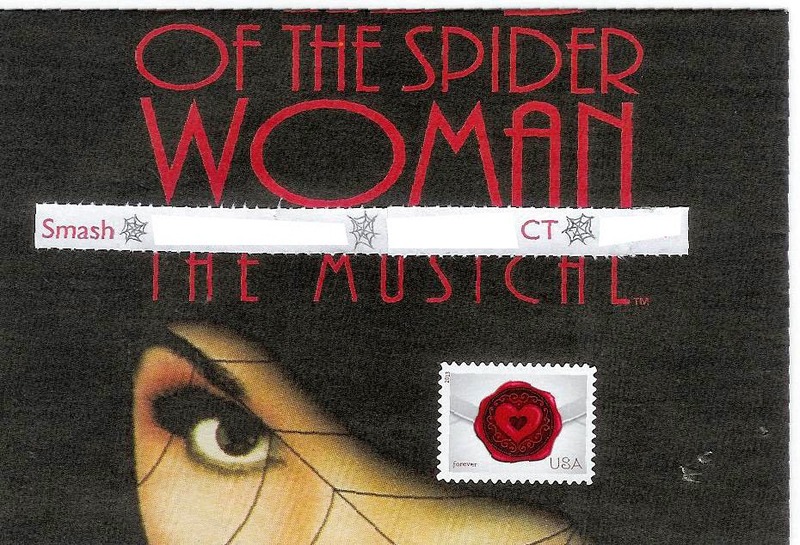 The US has been issuing stamps with the theme love for many years. Forever love (2015). Video story of the designer's view on forever love (4 minutes). I have these stamps, just haven't used them yet. I prefer the white version - with the small 'forever' and '2014' in silver (scans as grey). I still think it's a bit odd that the heart says forever and there is also forever written below. Here are some I sent and received. 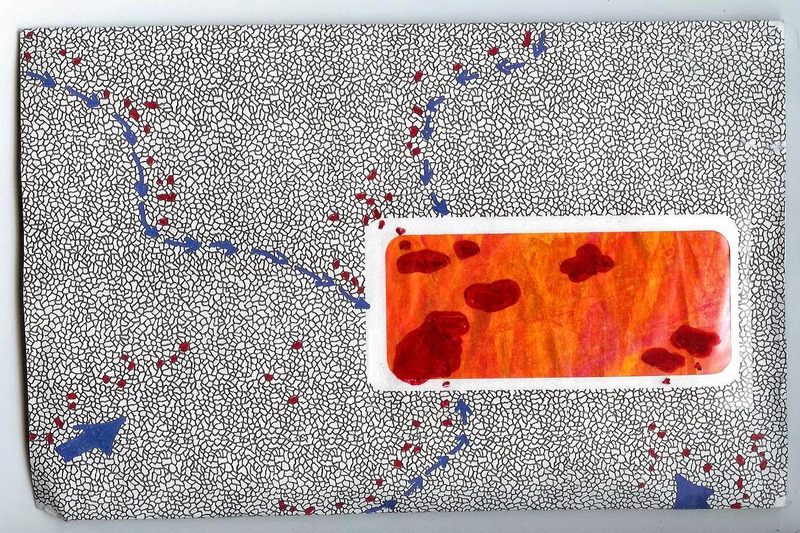 Cut paper heart (2014). 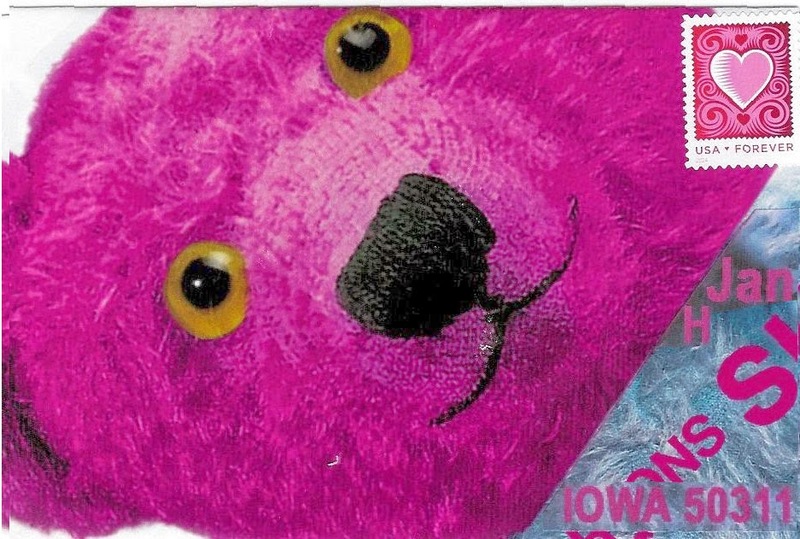 The one from Olathe has a unique digital color St Valentine's day postmark. 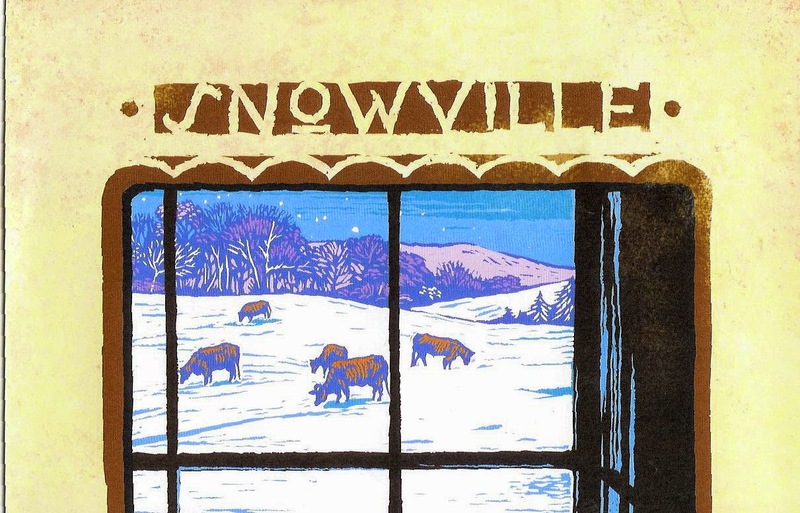 The story behind the design is here. 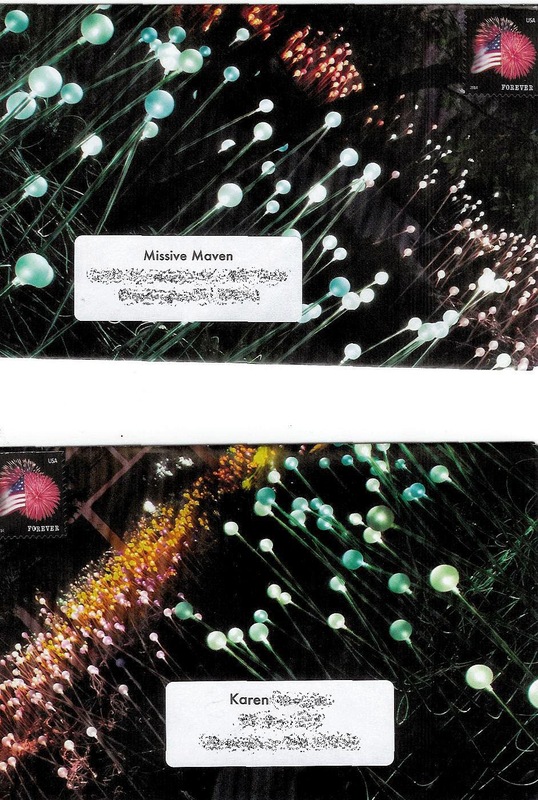 The 2012 stamp is Love ribbons. 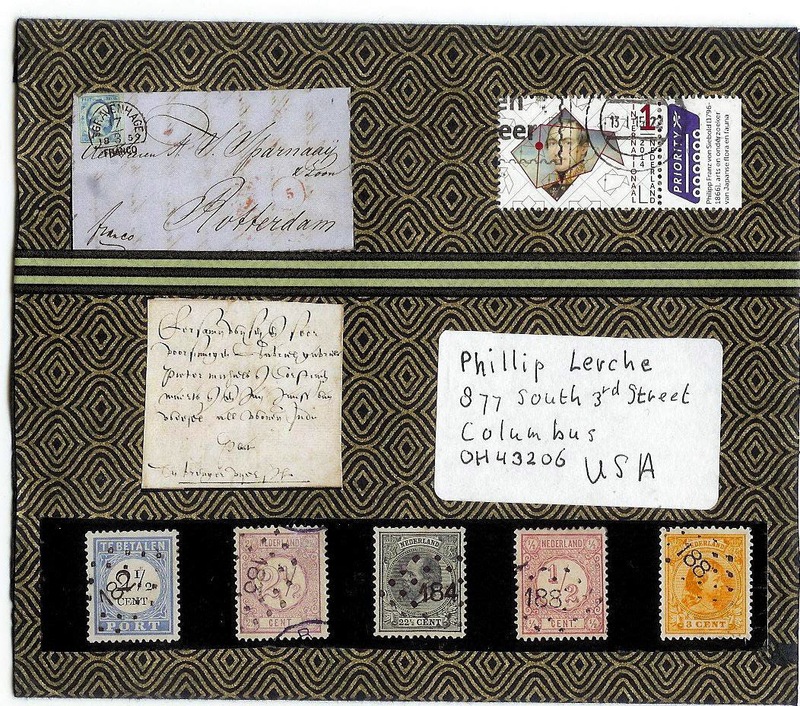 Out of print, a sheet of 20 stamps now sells for over three times the current first class price. 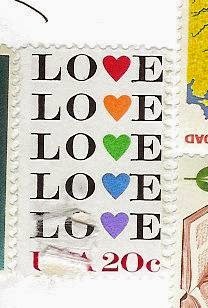 This 20c Love stamp is from 1984. Sadly many of the vintage stamps don't always stand up to the modern sorting machines, so this example is a little torn. 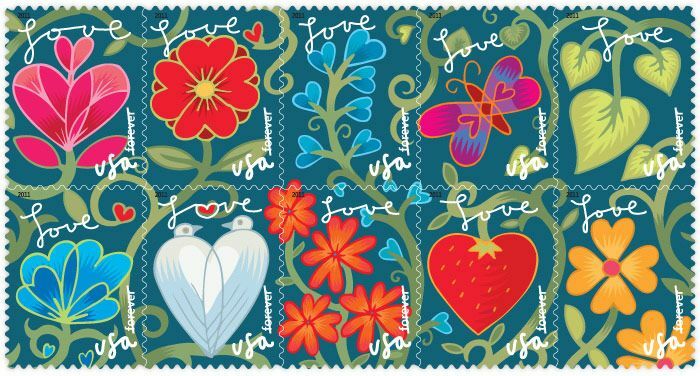 Of all the love stamps, I think this one is my favorite set, Garden of Love from 2011, even though I have never received any. 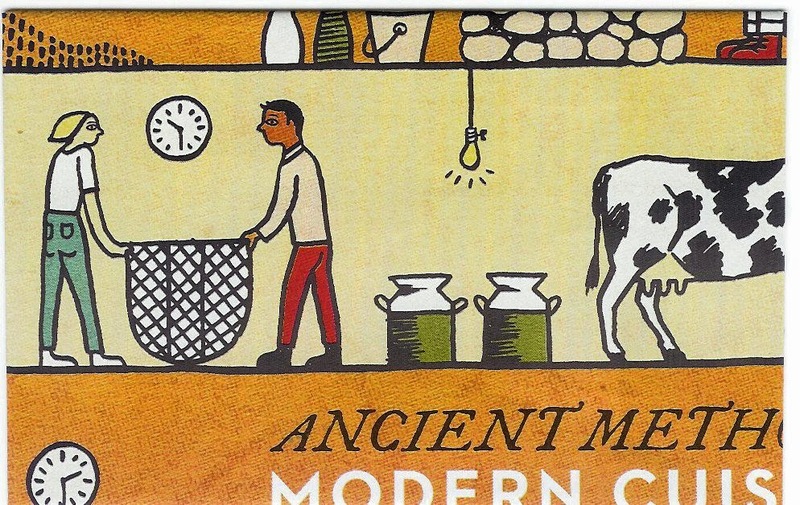 A very clever design, with a lot of variety in the set. 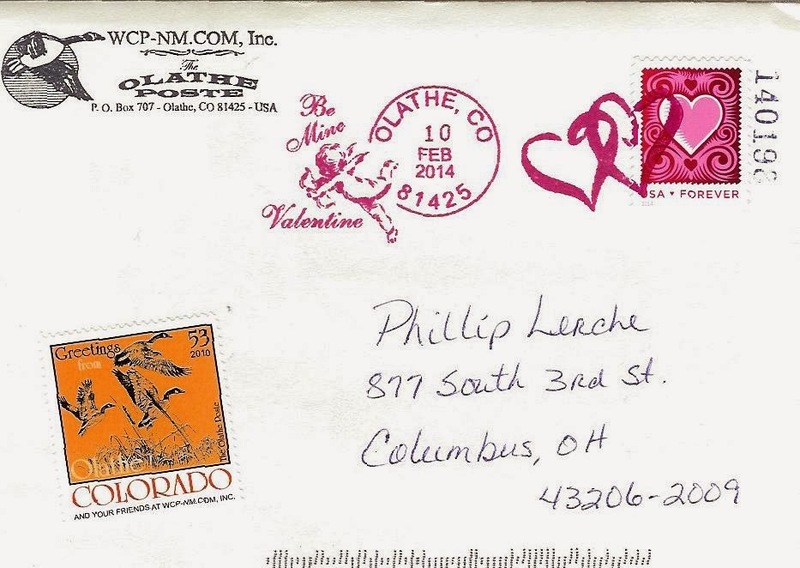 Just noticed that USPS Stamps has a feature on Valentine's day mail artists. 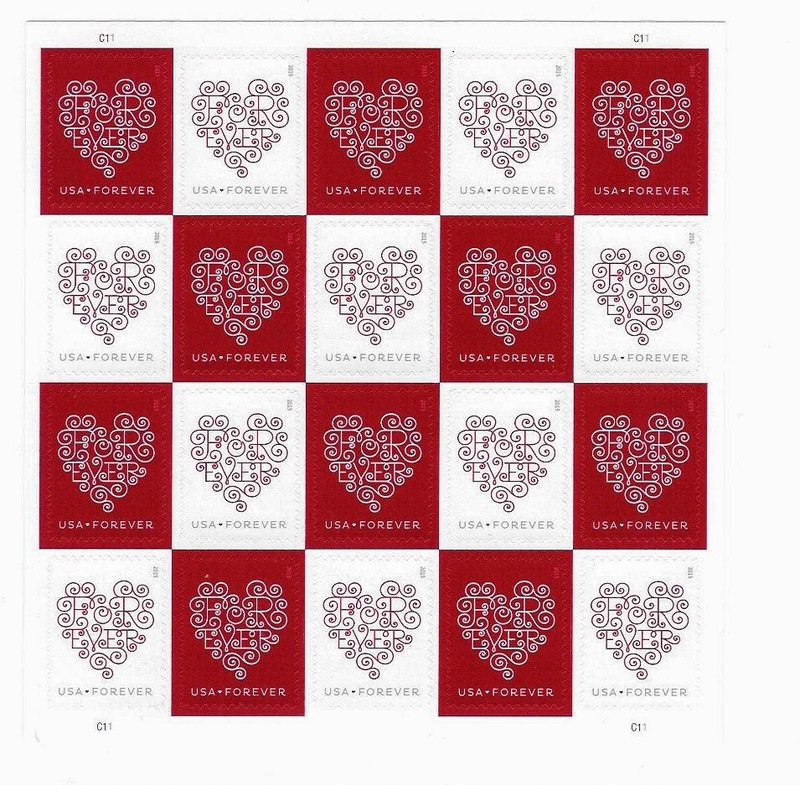 I'm not sure how long La Poste has been doing this, but they have a series of Valentine heart-shaped stamps designed by famous design houses (like Chanel, Hermes etc). 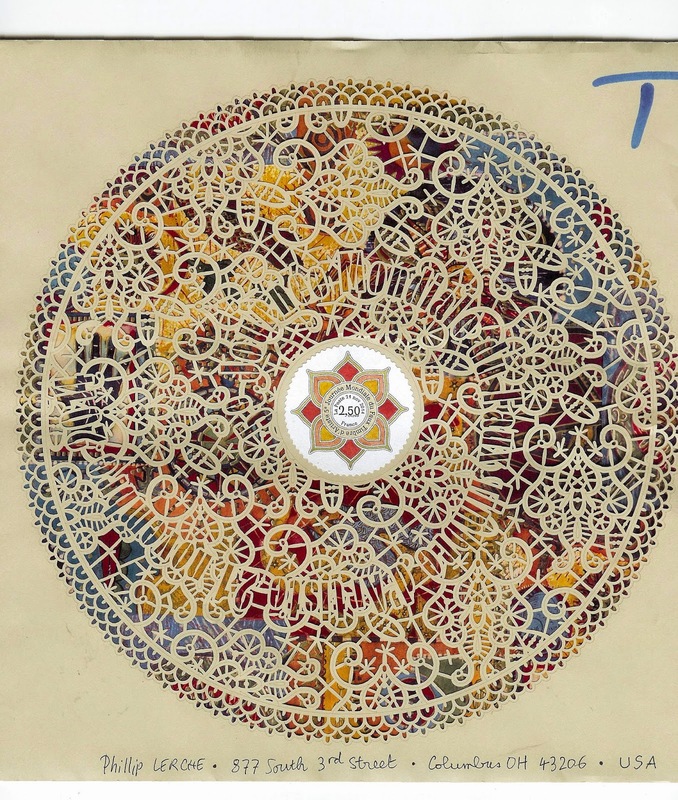 Many of the designs can be seen here. It's an interesting concept to have commercial enterprises design stamps (and have their names on them - great advertising) - I can't see this happening in the US. 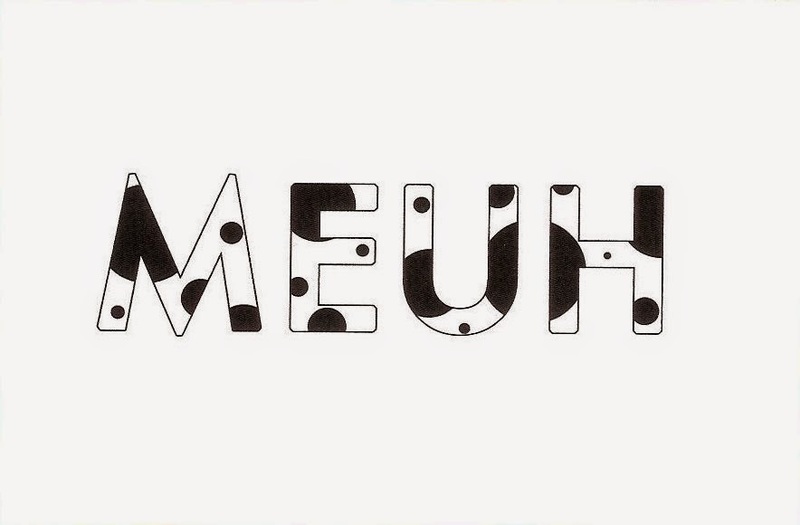 The 2015 set is designed by Jean-Charles de Castelbajac. 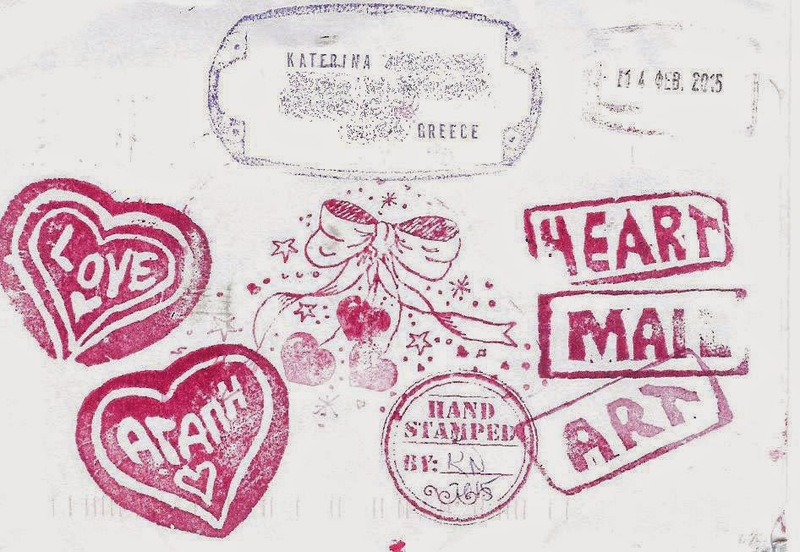 Rubber stamped hearts from Katerina N, all the way from Greece. 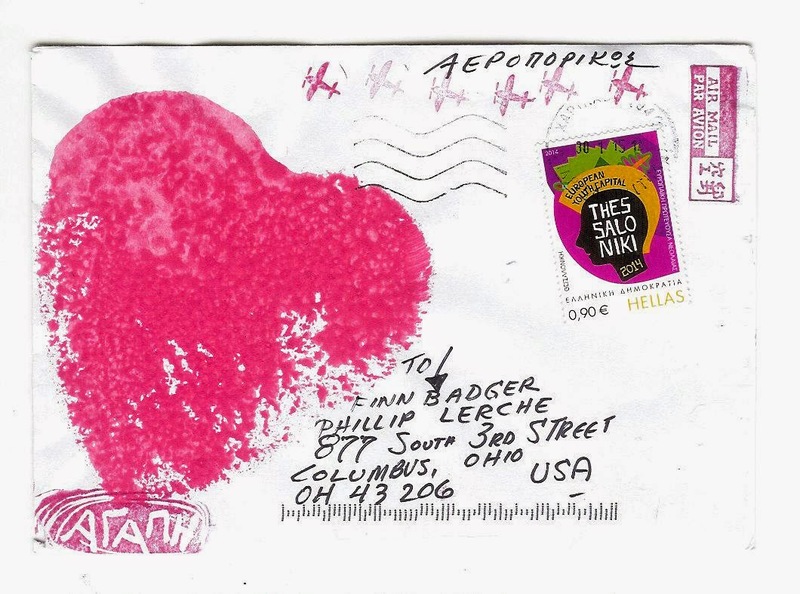 A big chunk of background on the Greek 'European Youth Capital Thessaloniki 2014' stamp is pink, does that count? Enjoy the rest of Valentine's Day, everyone. 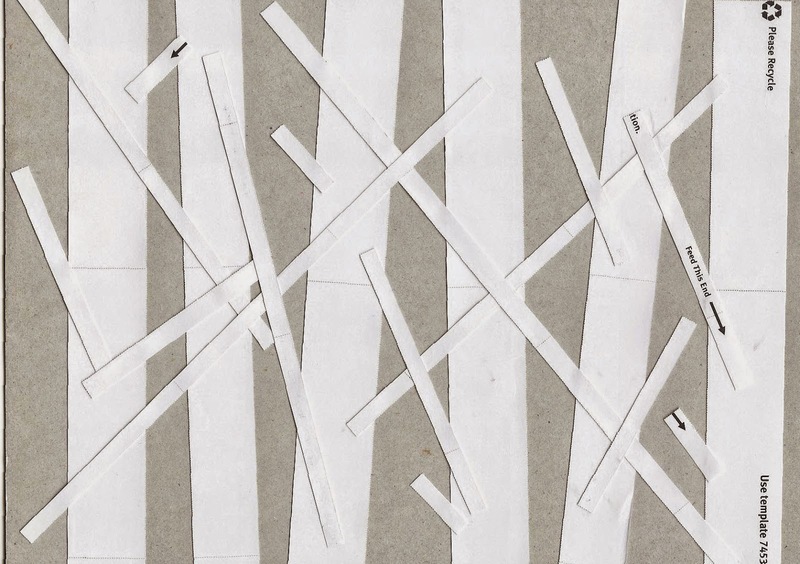 Last minute update: Eva blogged about Dr Turing's Love Letter Generator. If you've been at a loss for the perfect way to express your feelings, then this is for you - it's not too late! To me, you are more unfaltering than one million cherries, even more absorbing than the most beautiful summer breeze. Your lips are the most perfect. Your honesty is incandescent and your hand lazily appreciates my brilliance. You are a party, my only happiness, I desire only to bring and cuddle you for all eternity. Mysteriously accept my cheek, I beg of you! Your laugh consumes my compassion and all other cheeks pet in vain. You make each dreamy surprise allow like wit. Even the most impressive bliss could not entangle my eyelash so! That last line had me in stitches. Not to mention the image of petting a lot of cheeks in vain before finding the right one. 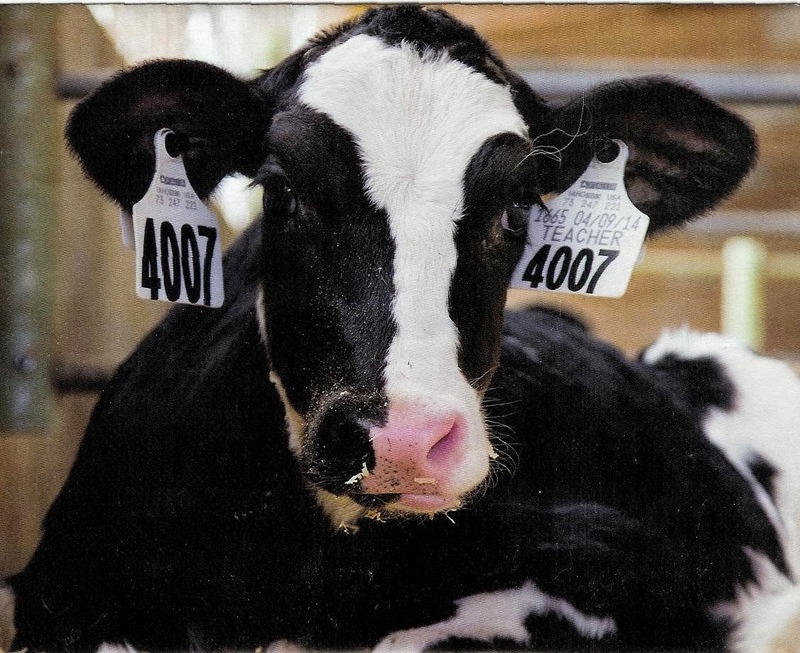 Karen's exchange part 4 - Groundhog Day!